Pumpkin pie, turkey, wine…what could be better? The holiday season is a great time of year for many people, bringing with it: time off work, more time with those they care about, and mom’s special yams. 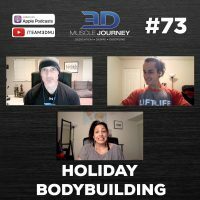 In today’s episode, Jeff, Andrea, and Alberto discuss what this time of year is like for those who have athletic goals. Throughout their conversation, the coaches cover a variety of strategies you can use to help you stay on track with your goals during this holiday season. Topics include: what you can do if you’re contest-prepping during this time, how to approach “the big meal”, what not to do, and what to do if you accidentally go a bit “too hard”. While a lot of these strategies also apply to those who aren’t physique athletes and who don’t have performance goals, the group make it quite clear that for those who do, having an athlete’s mindset even during the holidays is important (and oftentimes automatic). If you truly have big athletic goals and you want to see how far you can go, then maintaining awareness of your goals during the holidays is essential. Join us this week to learn a variety of tips and strategies you can use to help you navigate your way through this holiday season.